This article describes why a pressure gauge for fire extinguishers contributes to your safety. 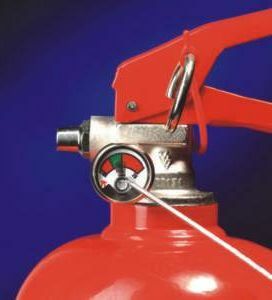 Generally, each fire extinguisher should be inspected as to its function after 2 years (note any special regulation!). After a proper inspection, the fire extinguisher receives in inspection tag which states the date of the last inspection. Furthermore, the service company which has checked the fire extinguisher must be stated. Informations regarding the next due inspection are optional. In "good old Germany", the DIN EN 3 standard and in Austria the ÖNORM F-1053 Inspection and Maintenance (after 11/2004) are the regulation standards for fire extinguishers. Additionally, instructions and regulations for inspection and charging are issued by the manufacturers, which are accessible to everybody in a company. Thus, the owner of a fire extinguisher has a certain control regarding maintenance work and the related costs. Leakage is a possible damage which causes the loss of pressure within the fire extinguisher. Some fire extinguisher types with integrated fire extinguisher pressure gauge allow the control of a possible pressure loss for anybody at any time. Therefore, when purchasing a fire extinguisher, it is recommended to ensure that a pressure gauge for fire extinguishers is mounted. In powder extinguishers, the powder tends to thicken. As a consequence, even under high pressure it cannot be blown out any more. This does not necessarily lead to a complete breakdown of the fire extinguisher. For example you can place the fire extinguisher upside down which causes the powder int the vessel to drop down. In any case, fire extinguishers in cars should be inspected every 2 years. Particularly wet extinguishing systems can rust through after a longer period. End of life devices must be handed over to authorised companies for recycling. If a malfunctioning, uninspected fire extinguisher causes a major damage, the insurance can reduce the compensation payment.